Clarissa "Clara" Harlowe Barton (1821 - 1912) founded the American Red Cross, served as a hospital nurse during the Civil War, ran the missing soldiers office to help families identify and bury soldiers properly, and was active in the suffrage movement. She was born in Massachusetts, daughter of a militia captain who inspired her with patriotism and humanitarian interests. She was sent to school at age 3, and at the age of 10, nursed her brother after a severe injury and administered his medicines. She received her teaching certificate at 17, after which she taught for twelve years in Canada and West Georgia, then opened a free school in New Jersey. She served in the U.S. government as a patent clerk in Washington, D.C., and nursed soldiers after the Baltimore Riots in 1861, the first bloodshed in the American Civil War. She began organizing and distributing medical supplies and food by soliciting donations in an ad in a Massachusetts newspaper, receiving a tremendous response from private citizens. In 1864, Barton was appointed by Union General Benjamin Butler as the "lady in charge" of hospitals at the front. 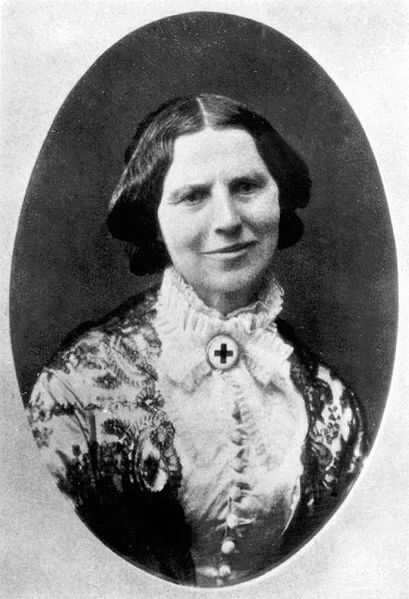 She became known as the "American Florence Nightingale". She provided supplies throughout the War, both to Union and Confederate soldiers. After the war, Barton discovered that families had sent thousands of letters to the government inquiring about their "missing" soldiers. She organized the Office of Missing Soldiers, from which she and her staff responded with more than 41,800 letters. She assisted in identifying and properly burying over 33,000 soldiers. Barton is best known for founding the American Red Cross, which she did after traveling around the country and abroad giving speeches about her war experiences and helping others in need. She befriended Susan B. Anthony and became active in the suffrage movement, While in Europe, she organized supply distribution during the Franco-Prussian War in 1870 and to the poor in Strasbourg, Germany and Paris in 1871. She received the Iron Cross from Prussia, and the Golden Cross of Baden in honor of her work. 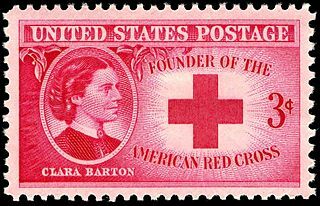 Barton returned to the United States and began work in 1873 to create the American Red Cross, attempted to gather support from President Rutherford B. Hayes, and was finally successful establishing the Red Cross in 1881, during President Chester Arthur's administration. The country now had a system in place for responding to crises other than war, such as natural disasters like floods, earthquakes, hurricanes. The organization continues to operate to this day providing needed relief during emergencies. Barton resigned from the Red Cross at 83 years old and founded the National First Aid Society. She published her autobiography, The Story of My Childhood in 1907. She died in her home at the age of 90.